Sri Lanka Tourism has kick started their promotional campaign for 2019 and around 15% of the budget has already been exhausted so far, said Director, Marketing at Sri Lanka Tourism Promotion Bureau, Madubhani Perera. The total budget for 2019 is around Rs. 6 billion. She said that most of the promotion budget was invested to participate in international fairs in 2019. Perera said that last year the sum allocated for tourism Promotion was around Rs. 5 billion but only around 75% of it was used. Meanwhile Minister of Tourism Development, Wildlife and Christian Affairs, John Amaratunga said that a proposal has been made to the cabinet to offer Visa on Arrival to tourists from Thailand. The Minister said that though they were targeting 3 million arrivals for 2019, if there were no political issues in Sri Lanka, this target can reach up to 3.1 million. He said that already there is a 2.2% arrival growth in January as against the previous year. Speaking at an event jointly organized by Sri Lanka Association of Inbound Tour Operators and Tourist Hotels Association of Sri Lanka (THASL) the Minister said that this year Sri Lanka will play host to many MICE events and the biggest would be the United Nations event in March where over 3,000 delegates would participate. 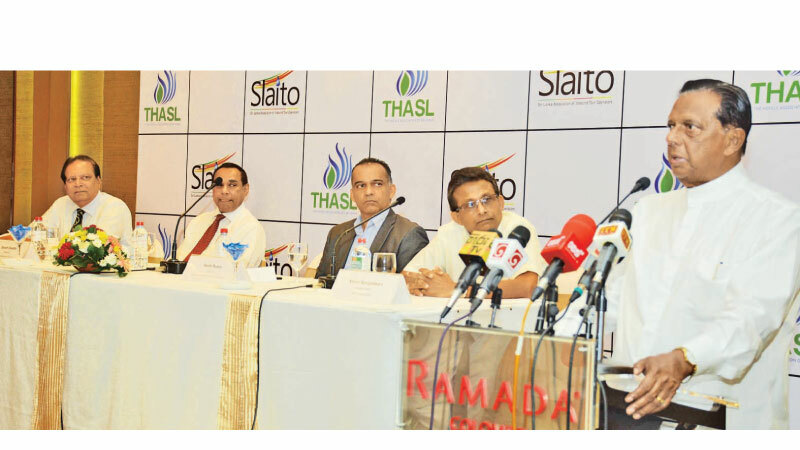 He however said that successive governments have not taken serious measures to increase capacity at the Colombo airport and this has put a check on many new budget airlines that want to fly to Sri Lanka. “There is a huge congestion at the immigration counters and steps should be taken to offer one separate lane for Sri Lankans which would speed up matters at Customs,” he said. The Minister also said that two former Vice Presidents of Sri Lankan Tourism Promotions Bauru, Nilmin Nanayakkara and Mervyn Fernandopulle were exonerated of all charges and this proves that the judiciary is impartial.